The body of A. A. Algase of Los Angeles, Calif., a former resident of Syracuse who died suddenly at Boston, Mass. will be brought to Syracuse for services and burial. Burial will be in Adath Yeshurun Cemetery. 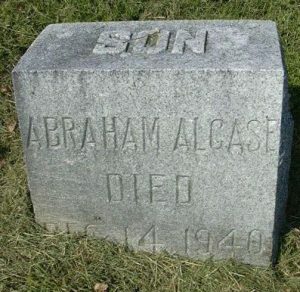 Mr. Algase is survived by a sister, Mrs. Rosa Cohen of Syracuse; a brother, J. W. Algase of New York City, and several nieces and nephews.